Hairy Mountain Folk: What's a girl home alone to do? What's a girl home alone to do? I'm normally fine to deal with small spiders and rescue them with the tried and true glass-and-cardboard method, but this hairy monster is a little outside my weight category - about 10cms wide. And of course, spider-wrangling hubby is away until tonight, so it's a bit of a Mexican stand-off between me and Harry (the hairy one). He's on the far wall of my office, which is fine as long as he remains there. I don't fancy doing my live-to-air radio interviews with him creeping towards me. 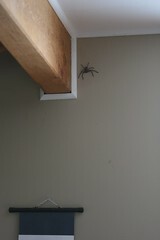 we have one in our bathroom at the moment, he's hanging around just behind the toilet. i have never minded them until now! At least there is one consolation ... at that size and weight you will definitely hear him coming which will give you time to run!